electro-magnetism had been discoved by Hans Christian Oersted, who published his work on this in 1820. Faraday took Oersted's work further. In September 1821, he discovered electro-magnetic rotations, the principle behind the electric motor. Photo of one of Michael Faraday's original wire-coiled iron rings, courtesy of the Royal Institution, where Faraday did his experiments. This device was not easy to construct and it has been found, by replicating the way Faraday would have done it, that it takes about ten working days to make. 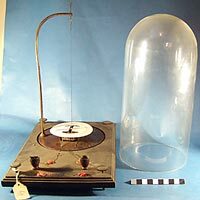 Photo of a galvanometer dating from 1800, courtesy of the Royal Institution. This is much more like the galvanometer Faraday would have used. When it's in use, the glass bell cover is placed over the mechanism. On 29th August 1831, Michael Faraday conducted an experiment with an iron ring, some copper wire and a big 4 inch plate battery. He was investigating the phenomenon known as electro-magnetism. Electro-magnetism describes the relationship between electricity and magnetism  electricity produces magnetism. Scientists hoped to find that the reverse was also true and many tried to demonstrate it. Faraday persisted longer than most, and finally succeeded. Here is a diagram showing the basic set-up of his experiment. 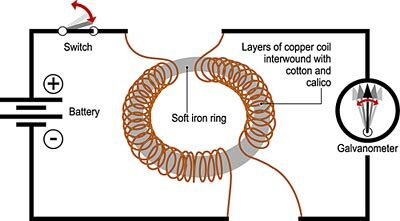 In the middle is a continuous ring made of solid soft iron. It's wrapped on opposite sides in two sets of unconnected copper wires. Let's call the left hand side coil A and the right hand side coil B. The wires don't touch each other or the ring at any point. They are wrapped around the ring in layers of cotton wadding for insulation. The coils have 2mm spacing between each winding. Each end of coil A is connected to a battery, which will provide the current. Each end of coil B is connected to a galvanometer, an instrument that detects current. As the coils do not touch, if the galvanometer were to detect current, electricity would have to have passed from one side of the ring to the other in some way. This diagram shows what happens when the current is turned on. When the battery is connected up, the needle of the galvanometer leaps into action, registering current in coil B. However, the effect quickly fades and the needle soon detects no current, even though the battery is still connected. If the battery is switched off and on again repeatedly, the effect can be reproduced over and over again, as rapidly as you like. 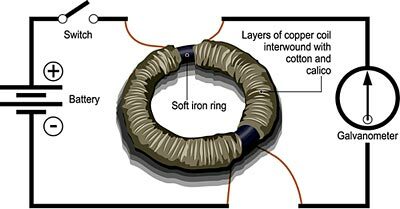 When the battery is connected up, electrons flow along the copper wire of coil A, round the windings round the ring. The effect of this is to induce magnetism in the ring. A magnetic field, or vibration field, of excited electrons is created, producing an electrical current in coil B, which is inside the magnetic field. This is one of Farady's great discoveries  electro-magnetic induction. The effect is transient. The current swaps back to coil A, despite the continued power from the battery. It's the initial connection 'kick' that causes the wave of excited electrons, hence the effect. Repeatedly switching the power on and off generates what we call alternating current (AC), since the current swaps back and forth between the two coils. This principle is the basis for much of our modern public electricity supply. So, what is a transformer, then? In setting up this experiment, Faraday invented the transformer  his apparatus is a primitve version of the transformers we use today, in everything from electricity substations to mobile phone chargers. Transformers take advantage of a particular aspect of Faraday's set-up. If the number of windings in coil A is different from the number of windings in coil B, you can transform the electrical voltage of the current when it swaps from one side to the other. You can transform up or down, depending how you displace the copper wires. If coil B has twice the number of windings than coil A, the voltage is reduced by half. This proved crucial for the public supply of electricity on a large scale, since power stations generate at certain voltages that need transforming at certain points in the distribution system for efficiency and utility. If you want to know more about this aspect of electricity, see supplying electricity. Modern electricty substations consist of very large transformers, working on the same principles that Faraday discovered. We use transformers in lots of other ways too. You can read more about the various kinds of modern transformers in an electrical conversation under 'distribution'. What did Faraday do next? Faraday realised that the phenomenon he discovered was a transient one, and at that time, people were looking for continuous generation. It wasn't until the 1860s that electro-magnetic induction is worked up for practical use and that work was done by James Clark Maxwell. Behind the ring you can see the small battery used to supply the current. 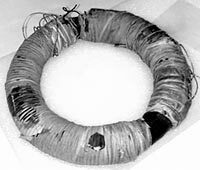 It is connected to the copper wire coil on one side of the ring. The (irrelevant!) jumble of wire in the middle is the connection from the other coil to a modern galvanometer, the needle of which is shown at rest, after the transient effect that ocurred when the battery was first connected.